Pirate themed slots are always going to be popular down to their appealing gameplay, and this new release from IGT is no different. The name is Captain Quid’s Treasure and IGT have ensured that this development is the most interactive and lucrative for players yet. All projects from this established developer have a certain high quality feel to them, with this particular game boasting some really impressive characteristics. The high quality animations and graphics is just one example, giving players bundles of entertainment with every winning line. IGT have decided to put a whopping jackpot on this game also, reaching a massive 50,000 coins, which is very generous when you consider the other lucrative features on offer. Spinning 5 of the games logo on an active payline will release this mammoth sum! In the meantime players can look forward to a host of smaller win lines, all made up by spinning the bundle of pirate themed paraphernalia, including; pirates, compasses, ships and the standard 9-A card symbols. Playing the slot couldn’t be more pleasing as IGT always design there games to be as user friendly as possible. 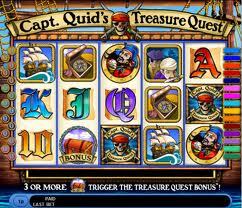 There is plenty of treasure to be found in this video slot, with the first being Captain Quid’s Treasure Quest Wild symbol, which substitutes for all the symbols within the game. Scatters can also be found in abundance, and players looking to access the games single bonus round will need to spin 3 or more treasure chests. Locating the loot is the aim of the game as players are invited to select points from the map to win a free spins and multipliers. Once the 5 selections have been made, the free spins round will begin and payers can sit back and enjoy the rewards of the booty. Players aren’t hit with a crazy story line or vivid animations from the off, so it is does make for a nice change for players who just want a relaxing spin. Whenever IGT releases a slot onto the market that includes a progressive jackpot, the outcome is usually very interesting and more often than not the game becomes hugely popular very quick so make sure you don’t let this one slip through your fingers. Combine this with the most attractive and popular theme around, and Captains Treasure is already shaping to be a big hit!